I was thinking about all the Open Mic nights around the Bay Area and the fact that technically a band could do an "Open Mic Tour" - granted there would be no pay involved, but the booking would be easy (just show up!) and there might even be some new fans to convert. You could be playing SF tonight! 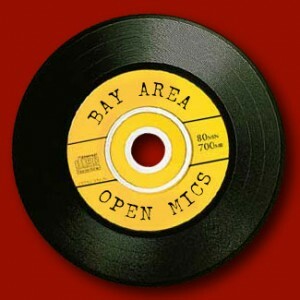 Oops - just did some Google searching and what do you know - there is already a totally awesome, comprehensive Bay Area Open Mic Calendar... so check out my baby list, then go to the REAL site. Danville/San Ramon - Every Monday night, Meenar in Danville hosts an Open Mic. They provide all the sound support, you provide your instruments and your talent. Note, this is not "jam night", if you sign up to play, you will get your chance to play however and whatever you want. We're providing P.A. for vocals and acoustic instruments (8 channels), 2 vocal mics and time for you to wow the crowd. If you need more mics, make sure to bring mic, stand and cable. Performances start at 9:00 and go until at least midnight. If we don't have a large number of acts, we run through one rotation and then everyone else gets another chance to get up and play again if they choose. Meenar Music Club, 349 Hartz Ave., Danville, CA (look for the green awning out front). Hosted by Chris Estes. Note: Everyone will get a chance to perform, but due to some management concerns, you are only guaranteed ONE song. After your first song, the manager has the discretion to move on to the next performer. 21 and older only. 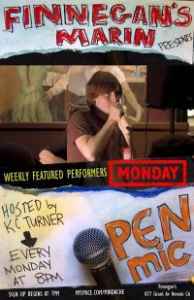 Marin/Novato - Open Mic @ Finnegan's Marin, hosted by KC Turner, attracts performers at all stages of their careers for the past 3 1/2 years! : from seasoned veterans to first-timers. Sign up between 7 & 7:30, show start @ 8pm, each performer gets 2 songs. In addition they have a 'featured performer'. The featured artist goes on at 8pm and plays for a half an hour. If you'd like to be a feature, just come and play the open mic a bunch of times and at some point you'll be asked to feature. San Francisco - Monday night open mic - The Hotel Utah Saloon (SOMA / south beach). Winner of "Best open mic" in the Bay Guardian's "Best of Bay" awards. Every monday night, we have an open mic at the historic Hotel Utah Saloon here in San Francisco. sign-up by 7:30. The Hotel Utah is located at 500 4th St. (at Bryant), SF, CA. The Utah has a house guitar, a piano, and a PA. So, if you want, you can come empty-handed and still play us your songs. San Jose - Open Mic Night at Philz Coffee. We are always welcoming musical artists, poets, or comedians to play at Philz Coffee's Open Mic Night! These are scheduled every Monday night. Sign ups begin at 6:00pm (first come, first serve, so be there to get a spot! ), and Philz closes at 8:30pm(for the summer; Philz closes at 10:00 during the rest of the year). Two microphones, speakers, and a PA system are available. If you need a quarter-inch cable, please bring your own. 10-12 minute sets. Philz Coffee is located in Downtown San Jose, at 118 Paseo De San Antonio Walk. Brisbane - First Tuesday of each month at the Historic 23 Club. Open mic with PA and backline. Historic venue, sleepy little town tucked away in the hillside between SF and SSF. Sign-up in advance or show up by 8pm. Club is at 23 Visitacion Ave in Brisbane. A short walk from the Samtrans busline 292, or plenty of parking. Santa Cruz - Conscious Open-Mic at Asana Tea House Tuesday Nights Every Tuesday 6:30-9:30. Bring talents - music, poetry, bands, dancing, collaborations. Santa Cruz - Verve Lounge in Aptos every Tuesday night. Big stage, custom lighting, professional sound system. Sigups at 8 PM, starts at 9 PM. San Francisco - Open Mic Tuesday's @ Red Devil Lounge (starts Tues. Sept. 7) - Come share your musical talent on stage at the Red Devil Lounge, one of San Francisco's most highly esteemed music venues! Doors/sign up at 7pm Must be present to sign up # of songs per sign up will depend on how busy it is. Show starts at 7:30pm No Cover charge - 21+ In addition we have a 'featured performer'. The featured artist goes on at 7:30pm and plays for a half an hour. San Jose - Open Mic Acoustic Jam...Every Tuesday...At The Poor House Bistro 91 S. Autumn, San Jose 95110. Come on down to the Poor House! It's acoustic open mic night every Tuesday 6 pm - 9 pm! Stockton - Stockton Borders Presents Singer/Songwriter Night. Tuesday Nights 7-9 PM, 10776 Trinity Parkway, Stockton, CA. 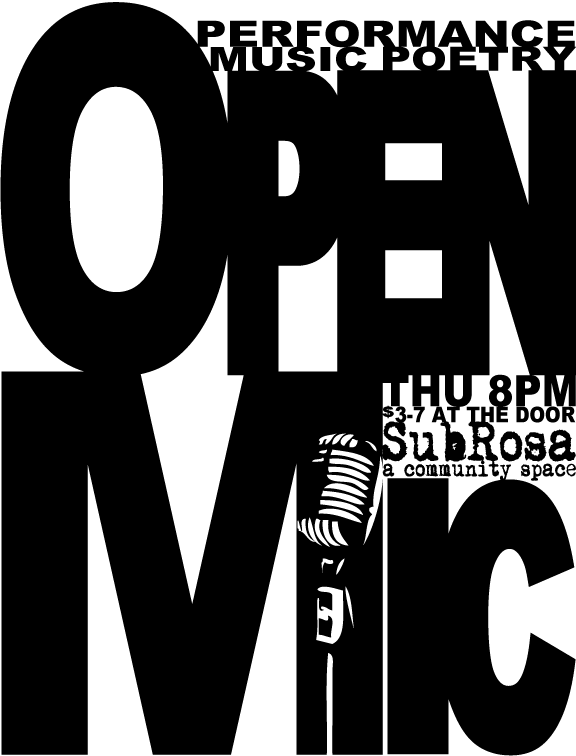 Corda Madera - Brand New* Open Mic @ Max's Cafe in Corte Madera hosted by KC Turner - Every Wednesday. Sign up @ 7pm - Show starts at 7:30pm. All Ages, House PA, 2 Songs per performer. Redwood City - Open Mic @ Angelica's Bistro at 6:30 PM with Randy Bales - Annex Room. Music is generally acoustic but we can run an electric bass through our board. There is also a piano available. Many performers who have played the open mic have been recruited into playing regular gigs. With three stages for live performance and the spring season kicking in, we are always on the lookout for new talent. Angelica's Bistro, 863 Main St. Redwood City, (650) 365-3226, within walking distance of Caltrain. Santa Cruz - Gadgetbox Recording Studio hosts a new open mic every other Wednesday night. 7-9:30 PM. Santa Cruz - SubRosa Weekly Open Mic, Thursday 8-10pm, (signups at 7:30), $3-7 at the door. No one turned away for lack of funds. Donations directly benefit this community-supported space. Music, poetry, and performance. From the mundane to the jaw-droppingly inspirational. Sunnyvale - Every Thursday night there is an Open Mic held at the Sunnyvale Art Gallery called "THE CANVAS". Sign-ups start @ 7:30 PM; performances starting around 8:00. Whether it be music, poetry, stand-up or spoken word, all forms of artistic expression are welcome! Come as a performer or part of the audience and enjoy the great atmosphere of this gallery cafe. Feel free to check out the Facebook group "The Canvas" or Youtube Channel "TheSunnyvaleCanvas" for more info and videos. San Mateo - Borders Books in San Mateo open mic night every third friday of the month from 9-10pm. If your interested, contact Chris at 650-483-3456.